Task: Auxiliary processor of Unimatrix Zero-One. Order - Place this personnel on the bottom of her owner's deck to discard four cards from the top of your deck. Then take up to four cards from your discard pile and shuffle them into your deck. 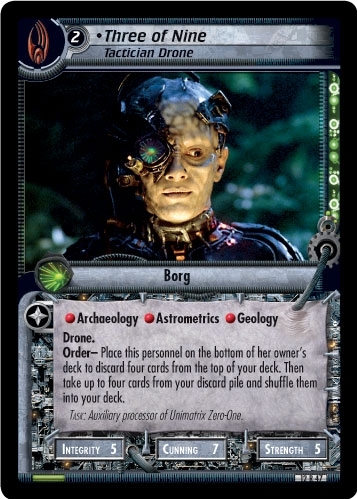 Characteristics: affiliation, manipulate your discard pile, Drone, Borg species. "Three of Nine, Tactician Drone" is a backward compatible card form the Second Edition expansion These are the Voyages - ST1E compatible (Copyright 2007 by Decipher). See collectors infos for this card in the Second Edition section under the UCT-ID: ST2E 12 R 47. Also see here for all trade lists with any card fom "These are the Voyages - ST1E compatible".